Pilates is one of the best-known fitness systems. Some will agree it is more popular than yoga garnering extensive practice among celebrities and anyone who likes to get fit in a more relaxed way. The Pilates reformer is a piece of equipment created to help you advance in Pilates beyond just using the mat. If you are a practitioner who would like to practice Pilates at home or you do not have time to attend Pilates classes, this machine might be just the right fit for you. Does a Pilates Reformer work? What to expect from Reformer Pilates Exercises? This is the most popular Pilates equipment designed by Joseph Pilates. This apparatus consists of a carriage, a set of springs, and a platform. The carriage moves back and forth along tracks, and all you do is provide resistance using your bodyweight. The frame is attached to one side of the reformer, and the springs provide the level of resistance by either pushing or pulling the carriage along the frame.Most reformers have a construction from both wood and metal. ​This is the part usually referred to as the bed frame. It is the part that you will either lie on, stand, sit, or kneel on. The carriage is moved by the part of the body you are using against it. You will be able to move the carriage by either pushing the foot bar or pulling the straps. ​The foot bar acts as a launch pad where you put the feet or the hands to propel the carriage forward. The height of the foot bar is adjustable to a high or low position to suit the height of the user. The springs, as we said, provide the resistance but only partial resistance as your body provides the rest. Each spring is attached to a spring bar where you can vary the resistance. There’s also a set of gears which allow adjusting the distance of the spring bar from the carriage. ​The headrest provides you with a comfortable position for the head. Since most reformer exercises are done when lying down, you can adjust the headrest up or down to fit a particular activity. The shoulder blocks come in handy to stabilize your body so that you do not slip off the carriage. ​These are connected to pulleys on the top of the reformer. The straps come with handles so that you grab when pulling or pushing against the carriage. Most people are told to try the Pilates reformer as part of their exercise and diet regime. There are even claims that you will be a celebrity look-alike soon after using. Of course that is not accurate. Weight loss is governed by how many calories you consume and how many calories you burn. A Pilates reformer comes in as part of a commitment to weight loss and a healthy lifestyle. That said, you should expect a dramatic change to your body by using a Pilates Reformer. It has been proved to improve core strength, flexibility, and increase muscular strength. If you are looking to have a better-looking body even without losing any weight, a Pilates Reformer is a great choice. You can do a variety of exercises on the Pilates Reformer to improve strength, balance, and flexibility. It offers the benefits of Pilates as you can do exercises standing up, sitting down, lying down, with lots of variations depending on your body strength. The amount of resistance on a Reformer can be varied which is unlike what you would experience when using a mat. The pulley system creates resistance that can be used to create a challenging body workout. This can be used to produce much faster visible results. The Pilates Reformer provides many more options than a Pilates mat. As such, it is an essential piece of equipment to have at home. Here are three simple exercises for beginners and experts the same. This is a favorite exercise on the reformer as it helps the trapezius and rhomboid muscles. These are the muscles that retract your shoulder blades. The exercise is done by pulling on the straps with bent elbows, and shoulder blades squeezed together. There are other variations in this exercise including with the hands pressed backward with the legs straight on the carriage. ​This exercise targets the abdominals and aims at stabilizing your spine. ​This workout involves a series of exercises that help to strengthen the inner thighs and pelvic floor. They allow you to breathe fully and as you engage the carriage so that you can activate the muscles in the legs. The benefits of Pilates Reformer exercises are seen in daily life. You will be able to sit in a better posture, be efficient in your movements, and even seem taller and graceful. For most people, the muscles of the core are strengthened which translates into a strong back, flat abs, firm thighs, and toned buttocks. Since the Pilates Reformer accommodates a full range of motion, you will be more flexible as the exercises train the body to retain length. In the seniors, Pilates Reformer exercises help to restore balance. As you give more thought to exercise, your body is trained to listen to itself. Less strain is applied to the joints which in turn results in better movement. The Pilates Power Gym Pro is a brand with a primary focus on helping you get fit using quality equipment. This mini reformer is aimed at you if you don’t have ample space for a standard size reformer. It gives you functional performance as you will get the most out of this apparatus. This machine is built to replace 17 weight machines so that you can do it all using one piece of equipment. It comes with three Pilates workout DVDs and the Power Flex Cardio Rebounder. These are sure to kick off your workout goals. With this model, you are guaranteed of the durability as it has a robust steel frame that can accommodate up to 300 lbs. Not only that, this Pilates Reformer has invested in your comfort. You get a unit that has comfortable foot straps, padded handlebars, and variable resistance cords. It allows you to change the resistance level quickly so you can switch from one exercise to the next in seconds. This reformer is an ideal machine for improved flexibility, toned muscles, and increased strength. Whether you are a beginner, a seasoned fitness enthusiast, an athlete, or senior, this reformer has you covered. Every Pilates enthusiast is bound to fall in love with the Stamina AeroPIlates 700 Premier. It is one equipment that you would like to have around because you know you’ll never outgrow its usefulness. Despite having the name Premier in its title, this Reformer remains relatively affordable for use at home. This model features heavy-duty steel construction. It is complemented by four robust cords that provide four levels of resistance. With this Reformer, you can expect to perform over 50 exercises which work to tone, shape, and stretch the entire the body. It boosts your flexibility and confidence in the process so be ready to feel better about yourself. We like that this a very silent machine owing to the smooth gliders and rollers. They ensure a productive workout that is safe every time. With the foam shoulder pads, oversized and adjustable headrest, you are guaranteed comfort while using this reformer. This machine is supplied with a low-impact free-form cardio rebounder and DVDs for Pilates exercises featuring Marjolein Brugman, a Pilates expert. The rebounder is 2 inches taller than a standard rebounder to give you plenty of flexibility in workouts. It uses a broader trapezoidal platform which offers more comfort than on regular reformers. Are you looking to achieve the long Pilates body? Then look no further than in the Stamina AeroPilates Pro XP Home Reformer. There’s no doubt that Stamina knows their way around Pilates equipment. This model is created with an 8-inch more extended length to accommodate persons of all heights. It is a reformer that will get you your dose of Pilates with an additional cardio workout. 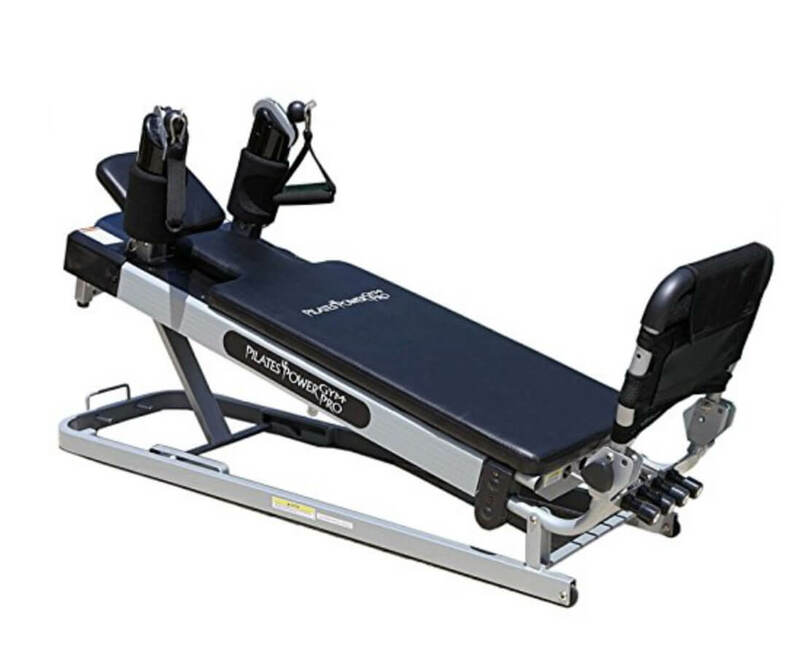 This reformer comes with four springs each for the resistance levels. It allows you to refine your Pilates workout and even include cardiovascular fitness using the free-form Rebounder. It will enable you to perform the safest exercises without putting extra strain on the joints while maintaining proper form without an instructor. When it comes to durability, this reformer boasts a robust frame with an oak wood finish. It is also complemented by aluminum rails that keep it performing in top condition. You will love working with the adjustable straps, ropes, and handgrips as they are designed for any user. The footrests can adjust to three positions while the cardio rebounder fits into holes at the base to act like a trampoline. Overall, you have a reformer that is kind on the joints and connective tissue. It allows any user whether a beginner or an experienced user to take advantage of the 100 possible exercises on the Stamina AeroPilates Pro XP 557. If you require a powerful Pilates Reformer, but you are on a limited budget, this is the model for you. The AeroPIlates Reformer 287 is a revered reformer as it allows you to perform challenging exercises. This unit offers gliding a motion that supports comfortable movement without stressing the joints. It is an ideal pick if you do not have time to go to Pilates classes. With three cords, you have three resistance levels to give your workout a challenge according to your fitness level. You will love using the padded platform as it provides comfort during all exercises. Not only that, it has a padded and adjustable headrest that is fast and easy to adjust. The textured standing platform and padded foot bar are just what you need when executing traditional Pilates exercises. This model has been designed for beginners and anyone with limited space. It allows you to store it compactly since the frame folds. You will also appreciate the mobility wheels since they provide easy portability from one location to the other. This reformer will help you get into more resistance exercises as it assists in building stamina and strong muscles. 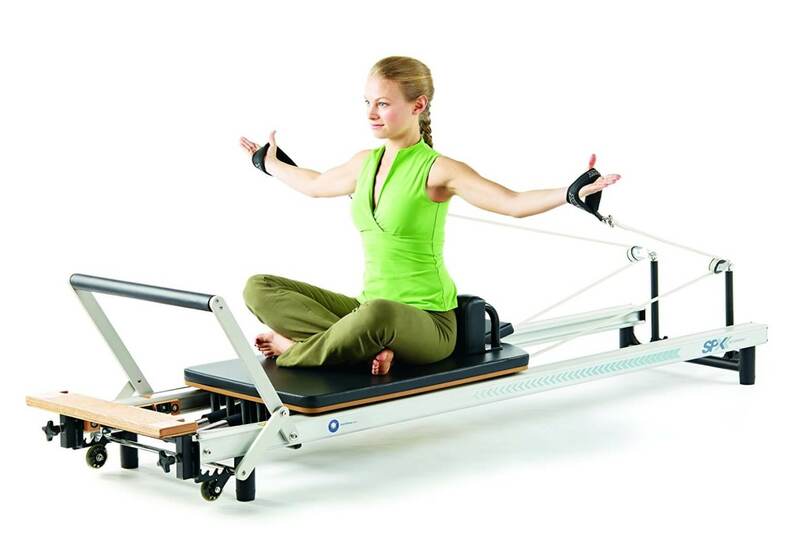 The MERRITHEW Pilates Reformer is a professional-quality model. As you can see, it comes with everything you will need for Pilates exercises and a whole lot more. With the capability of 250 exercises, you will never get bored or run out of ideas with this equipment. There’s a reason this reformer is found in homes. First, it has a long-lasting construction with a sleek and aesthetically appealing look. It comes with a reformer box with additional height for more range of motion. You can perform cardiovascular exercises when lying or seated on the reformer box. The reformer box works with a foot strap which is great if you have tight hip flexors. You have a machine that is supplied with an enhanced spring package. It has been built to allow smooth spring extension while minimizing noise. It can also withstand rigorous allowing you to use it for advanced workouts. The MERRITHEW SPX uses UVA foam padding on all the sensitive areas. This includes the carriage and extender to allow superior tactile feedback when working out. The extender is a useful accessory which enables you to maintain a seated position if you have hip flexion issues. With the metal roll-up pole, you can increase your focus on scapular stabilization. This is an all-around reformer for hundreds of exercises. It will help you kickstart a fitness journey or improve your skills that you already have. It is pricey, but the additional accessories are worth the investment. When you want to get better at Pilates but do not have enough storage for a reformer, the Pilates IQ model gives you that convenience. It assembles in seconds and will fold up for storage. It has wheels that allow transporting of the reformer in an upright position. You will like that the wheels enable using this reformer on carpets or hardwood without any damage to the floor. This model includes springs that are tested to provide progressive resistance that is consistent with Pilates Reformer exercises. It has ropes that adjust effortlessly with nautical clam cleats. The padded foot bar offers four different positions with the use of simple knobs for quick changes. The headrest is also comfortable, offering three adjustable positions. This gives you proper support at all times. It is easy to lock and unlock the telescoping rails. It has simple lever locks that make setup a breeze. The platform has a professional-grade vinyl covering that provides more comfort for the knees and elbows. You will appreciate its smooth carriage ride since it does not have seams on the track. This gives you a easy ride which helps you achieve excellent performance on any workout. The first look at the Allegro 2 Reformer is not all inviting. But a closer look presents a machine with lots of versatility. Even the price tells you what’s in it with the Allegro 1 design. While some reformers use appealing elements like wood finishes, this is a metal tower that comes with lots of instruments and pulleys, with a few maple wood accents. It is one of the most promising Pilates reformers for both beginners and expert practitioners. This is not one of those reformers that are designed for a specific group. Anyone can use it seeing that it has lots of possible adjustments to suit different users. It comes with a totally integrated seamless carriage that rides silently. It has well-padded and adjustable shoulder rests so that you can attain a wide or narrow shoulder position. It also has a vast range of adjustments for the height and ropes to ensure you can achieve the most comfortable position. This reformer can fold down such that it stacks on top of itself. This creates an excellent package that can be stowed away. But it does not have wheels, so you will find it hard to move it from its initial position. However, this reformer is highly durable thanks to the anodized aluminum frame. The AeroPilates 5-Cord Reformer is a promising model by Stamina. It is the kind you choose when you want intense Pilates workouts from the comfort of your home. This product is also one of the reasonably priced models making it ideal for use at home. This reformer is designed to help with low-impact high-result exercises. You can expect to see the results of your workouts without complaining about torn tendons or a strained joint. The five elastic bungee cords offer five medium resistance levels. It is, therefore, ideal for beginners and seniors who want to start with gentle exercises. The two DVDs and two beginner workouts plus the basic rebounder workout with the AeroPIlates will get you moving and enjoying your fitness routine. Comfort is of utmost importance with this reformer. It features 3-position adjustable headrest, high-density foam shoulder pads, six non-skid supports, padded hand and footrests, and ergonomic risers. The risers allow you to make swift strap height adjustments. Not to mention, the platform is textured meaning you will always be in control thanks to the additional balance. You have everything to gain by owning the best Pilates Reformer. This list narrows down some of the best models from top brands. Here, you will find reformers built with you the user in mind. They are comfortable and safe to use for everyone including the seniors. Before you make an investment in a new Pilates Reformer, remember to check out the features offered by these brands. You will not be disappointed.